A profile of the young Palestinian leaders who are sitting opposite the Israeli negotiation team at the Middle East conference table includes detailed descriptions of such fascinating personalities as Ziad Abu Zayyad, Hannan Ashrawi, Zahira Kamal, and others. A more moderate, pragmatic, highly educated and genuinely representative leadership has emerged out of the intifada and is, as the authors show, in a legitimate position to negotiate on behalf of the 1.7 million Palestinians in the West Bank and Gaza Strip. The Palestinians profiled here--some of whom, like Hanan Ashrawi, came into the public eye just last year during the Madrid peace conference--are regarded as probable leaders of the yet-unborn nation of Palestine. The Wallachs ( Arafat ) carefully define the varying positions of these 12 leaders toward Yasser Arafat, the father of Palestinian nationalism, and toward Israel. Included are the views of the mainstream Fatah, the Democratic Front for the Liberation of Palestine, the People's Party (formerly the Communist Party of Palestine), the Islamic Resistance Movement and the extremist Popular Front for the Liberation of Palestine. In these sympathetic, well-developed portraits, two major themes dominate: the Palestinians' perception of themselves as victims of hatred, discrimination and oppression, and the willingness of most of the emerging leaders to accept the existence of the Jewish state--as long as they are given the opportunity to achieve their own independence and statehood. Copyright 1992 Reed Business Information, Inc. This book profiling 12 emerging Palestinian leaders is "intended to bring the observer one step close toward feeling life in the occupied territories,... towards understanding the conviction that comes when the struggle is intensely personal." 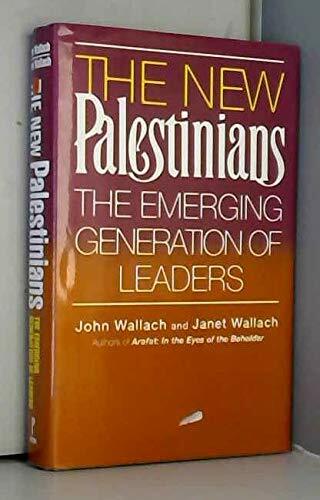 Inspired by the Madrid peace talks begun in October 1991, the Wallachs present the spokesmen for the new generation, a generation of well-educated secular leaders ready to recognize Israel if they have the opportunity to build their own state. They introduce Palestinians with a variety of views--mainstream, leftist, militant, religous, feminist. The Wallachs are convinced that this is a crucial time for Palestinians and for Israel's future, but their argument is strongest on the personal and emotional level; they will not convince the skeptical without better analysis or documentation. This could be a useful acquisition for libraries, but only to supplement more solid discussions.